In the 12 years since San Francisco’s historic Ferry Building was renovated, the artisanal food market on the ground floor has been going gangbusters. On top of that, three times a week, the Ferry Plaza Farmers Market just across the Embarcadero draws big crowds of its own. But the arcades along the front of the Ferry Building have never been very active, especially when the farmers market isn’t in session. Hopefully, that will change with the opening of five new exterior retail kiosks this spring. Outdoor kiosks were actually part of the original Ferry Building restoration plan, but they were never built. In recent years, the Ferry Building has added a number of kiosks to the interior— little shops that give small businesses, some just starting out, a chance to take advantage of the market’s heavy foot traffic. The new outdoor kiosks occupy space behind the arcades to the north of the entrance. Given the historic significance of the 1898 Beaux Arts Ferry Building and its prominence along the waterfront, it was extra important to try to insert them as sensitively as possible. We designed them as freestanding modular structures that attach to nonhistoric walls and floors, and they can easily be removed in the future without harm. This part of the building used to be a ticketing and circulation area, so the new use is compatible with the original one. Existing nonhistoric window openings located along the eastern wall have been infilled to match the existing painted plaster wall surface. We presented the design to San Francisco Heritage, the San Francisco Planning Department’s Historic Preservation Commission, and the Port of San Francisco, and they were all supportive. Our original thought was to create open-air kiosks, but the San Francisco Department of Public Health required them to be enclosed. 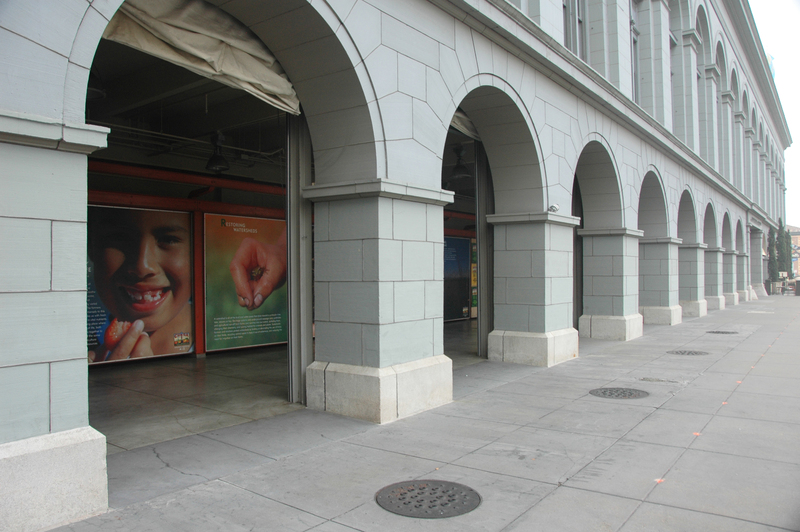 At the same time, the Port of San Francisco wanted to maintain the open quality of the arcades. So the kiosks are partial height and placed so that there’s a 10-foot clear path between the kiosks and the arcade for circulation. The kiosks have a high degree of transparency—our idea was that they would be like a jewel box on display. You could look in and see food prep happening. The kiosks themselves consist of painted steel modular structures with bonded bronze and glass infill panels, so they read as clearly contemporary. A door connects each kiosk to the nave on the inside, which could come in handy if one of the indoor tenants wants to lease one of the outdoor kiosks, but otherwise would remain locked. Each kiosk has an open area associated with it, which can be used for seating or display purposes. The open display or seating areas are enclosed with sliding metal gates that open and close in tandem with the adjacent retail kiosk’s gates. We looked at two precedents in San Francisco for design inspiration. One was the Hall, which is a temporary food and drink venue in the Mid-Market neighborhood on Market Street. It has six independent local food vendors and centralized seating. The other was Second Act Marketplace and Events, a neighborhood marketplace on Haight Street that includes stalls for five food and beverage retailers, plus an event venue. The Hall has a shared commissary, which made a lot of sense to us, so we carved out room for one by shrinking one of our kiosks a little. We wanted the kiosks to look elegant, not like back-of-house areas in a restaurant, so having a dedicated commissary allows tenants to keep most back-of-house food prep out of sight. Each enclosed kiosk will have a three-compartment sink, a hand-washing sink, and counters and casework for storage. All plumbing piping and venting and all mechanical equipment will be concealed. Each tenant will come up with their own signage, but we’ve provided a mesh armature for them to hang it on, to create a sense of cohesiveness. Given the popularity of the Hall and Second Act, we hope these little food stalls will be a hit with Ferry Building regulars and newcomers alike. There’s just something so cool about these kinds of venues. having a curated collection of one-of-a-kind, small, local, artisanal food and drink options in an environment that encourages spontaneity. It doesn’t take much space, but the effect can be really lively.